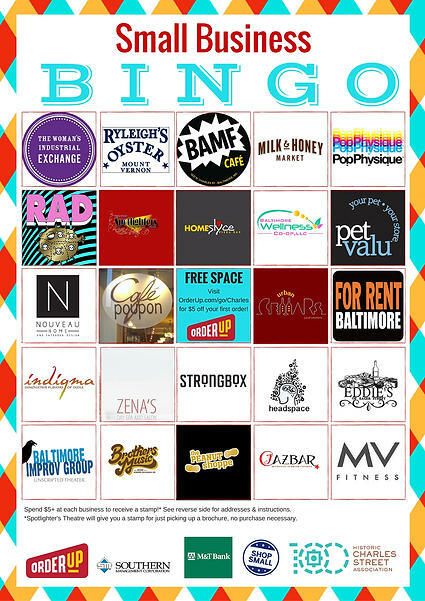 Launching November 28th on American Express' Small Business Saturday, Historic Charles Street Association is introducing Small Business Bingo, a game designed to highlight local businesses throughout the Charles Street corridor from Downtown to Old Goucher. Small Business Bingo will run from November 28th to December 31st. The cards task participants with spending $5 or more at local businesses, where they will receive a stamp. Submitting a card with one line completed counts as one entry into a raffle, two lines counts as two entries, etc. Participants can either download a bingo card online or pick up a paper card at participating businesses. Once line(s) are completed, cards can be submitted online. Prizes include gift cards, passes and merchandise from the participating businesses. Click here for more information and to download the card!